Few things are known about this pagan black metal band from England. They don’t have any official site and none of the band’s member(s) is mentioned in the booklet of the CD. Ildra were probably founded on 2004, when their first demo “Beorna Beaducraeft” was out. Next year they released their second demo “To Elreordgum Landum” and in 2007 their last demo “Þær Swefende Hæleð Licgað” was out. All 3 demos were cassettes and the last 2 were released by Heidens Hart Records. In 2011 their debut full-length album “Eðelland” was released by the German label Sonnenrune Records. 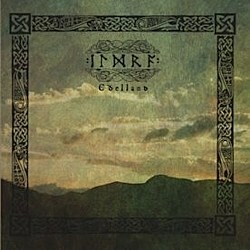 Ildra play pagan black metal with some folk influences in their music, especially in the acoustic instrumental songs. There are 9 songs in “Eðelland” and 4 of them are instrumental interludes, but the 5 main songs are quite long, so the album lasts for almost 47 minutes. Ildra’s music is totally based on the guitar lines. Epic rhythmic riffs and lead melodic guitars are combined with nice acoustic guitars and a few traditional instruments in the background (as far I can tell there are no synths). Their compositions are mostly in mid-tempo and their sound is somehow raw, but at the same time very rich and warm. The production is exactly as it should be and they have a very balanced mixing, where all instruments are at the right level. Their vocals are typical pagan black metal screams combined with a few clean male recitations and some background choirs in the refrains. Someone could find Bathory influences in their music, but then again all bands of the genre have Except for the instrumental tracks, there are also acoustic parts inside the “main” songs too and I believe the excellent use of acoustic guitars as a “folk instrument” in the metal orchestrations is what gives Ildra its personal sound. Their lyrics are written in ancient Anglo-Saxon language, so it’s more than obvious what they deal with and how much work they have put into it! “Eðelland” is a hidden treasure that pagan black metal fans better dig out. I don’t know if Ildra will release any new album soon, but I hope so, ’cause their debut is great. Since they don’t have any official links you can search for their songs on the internet on your own. The album is released by Sonnenrune Records in a standard jewel case with a beautiful 12-page booklet including all the lyrics for those who can read this ancient language. The dutch label Heidens Hart Records will release the LP version of “Eðelland” later on 2012.